London Fashion Week. A glittering of flashbulbs lights up London. Reams and reams of makeup used in one day. Hair straightened, curled and straightened again. A million outfits worn and discarded ….and that’s just my bedroom! LFW is a hive of activity, and I’m a fan of always being prepared for anything. Who knows, you could blag a last minute invite to a show or after-party – anything could happen! So what do I arm myself with during the week? These are my top five products to see your Fashion Week face through any activity. Wearing a classic outfit but worried it’ll be boring? Sometimes less is more but if you’re looking to liven up your LBD without going too far, try an accessory nail for a little hit of chic on a classic outfit. This feather manicure by Ciate works by sandwiching the feather between coats and the result is glamorous, luxury nails. A perfect statement that will make for a brilliant conversation starter over the canapes. Scored a last minute invite to the after-party? 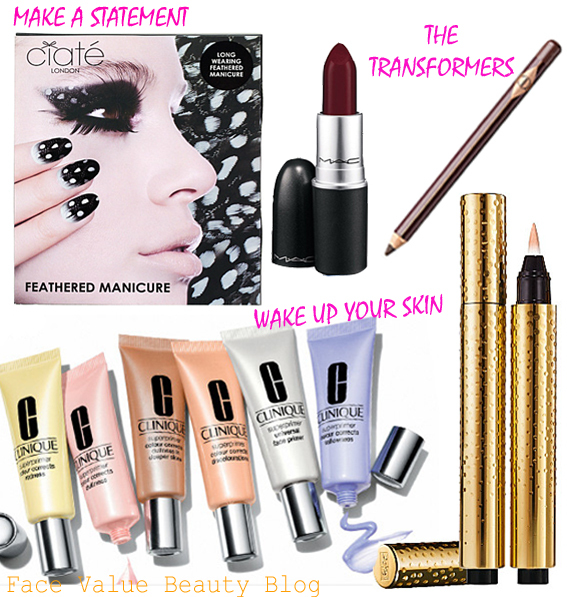 Lipstick and eyeliner are the only two products you’ll ever need to transform your look at a seconds notice. Simply add drama to your lips and eyes. A power pout is the mark of any screen siren – I think pillarbox red has the tendency to look a bit cheap on the wrong skintone but this classic blue-hued berry red is All Fired Up by Mac and it suits almost everyone! I apply straight from the bullet cos, lets face it, no one has time (or skills) to apply it with a lip brush when you’re trying to dash between shows! This Charlotte Tilbury Classic Eye Powder Pencil is both smudgeable and buildable. This is my favourite trick to take eyes from day-to-night in an instant. Use it for feline flicks during the day then smudge it over the lid and under the eye to build up a smokey-eye look for the after-party! The trick here is blending. Above I’ve drawn in the line of the crease and then blended it upwards and over the lid. This pencil is long-lasting too, so it’ll take you from day-to-night-to-the-morning-after! This new range of super primers by Clinique is great. I LOVE them. There’s a primer to suit every skin need. Woken up with a bit of a booze rash? Use the yellow one to correct redness. Got skin duller than the LFW weather? Use the pink one to brighten. I like to concentrate these around the nose and under the eye before applying my foundation. And finally, the best multitasker for instant pretty. I know it’s a huuuge cliche but the YSL Touche Eclat really is great for adding radiance to tired fashion week faces and faking that wide-awake look. I’ve written more on how to use it here. The keen-eyed amongst you will have noticed that the Touche I’ve featured above is actually a limited edition one. Perfect for Fashion Week, this sparkly embossed Touche Eclat is inspired by the crystal bead-covered Haute Couture ‘Edition Soir’ evening gown designed by Mr. Saint Laurent himself in the 1960s. OooOoooh. So there you go, five products to keep your Fashion Week face ready for anything! The only thing to do now is work out which is your best side. What are your five must-haves for Fashion Week? Have you tried any of these? Will you be trying out my eyeliner/eyeshadow transformation trick? Which side is YOUR best side? Mine’s my right….